Burano is probably the most colorful land mass in the famous Venetian lagoon. The houses, it is said, are colored so that fishermen way out at sea could recognize their own abodes. These brilliant colors have become so iconic over the years that residents are now required to get approval from the commune before painting their houses to ensure the tradition continues. Yet with all this color on an island known for its lace (the lonely fishing widows had to have something to do!) the dish everyone seeks is largely white and served on white plates, a dish reflecting the Italian genius for simplicity and purity of taste. You can get to Burano directly by vaporetto from Venice. That's the lazy way. You don't develop an appetite by lounging around on a ferry. What you do is this: vaporetto number 12 takes you from Venice's Fondamente Nove to Murano and on to Mazzorbo and then to Burano. Don't take it all the way to Burano, but stop in Mazzorbo, get off and follow the signs to Burano. That will take you on a nice, flat walk over a bridge to the island of Burano. On the way you'll see the famous leaning belltower, the Campanile of San Martino church. Not all leaning things are in Pisa you know. From the ferry landing walk up the main street until the canal, turn left and soon you'll be on Burano's main drag, Via Galuppi. Walk past all the restaurants, run past the ones with hawkers insisting you look at their badly translated English menus, run faster if there are pictures of the food. At the end of the street on the left, before the piazza enlarges, you'll find Trattoria da Romano. Towel off and try to get a seat. You can reserve online to avoid being shoved into the atmospheric interior with the locals; the terrace outside is pleasant most days. Now that you're tucked into the table, you're ready to order. You want what Anthony Bourdain ordered when he went there. Risotto Buranello, what Tony calls "Gó fish risotto." If you go to the Rialto fish market in Venice, you'll see these Gó fish, these rather ugly denizens of the lagoon, flopping around in their Styrofoam prisons. You won't find a sliver of one in your risotto, don't worry, only the aromatic broth of the fish is used to make the famous rice dish. In summer you can augment the risotto with a seafood appetizer. It makes for a light, easily digestible lunch. Now you're ready to hit the Lace Making Museum, or take the short hop on the vaporetto to Torcello island to see the Byzantine church and mosaics. As for eating at restaurants in the rest of Italy, don't just look at the menu and order. Talk to the waiter. They speak English. Ask what the day's specials are. Even if you ask for a menu in Italian and speak Italian to the waiter, you're not going to get the daily specials recited to you if you're a foreigner, no matter what region or city you're in. So ask what's best to eat that day. Really. For example, Venice's celebrated soft-shelled crabs from the lagoon, called Moeche, have a short and variable season (in spring) and you'll miss them if you don't ask because they can't be put on printed menus. 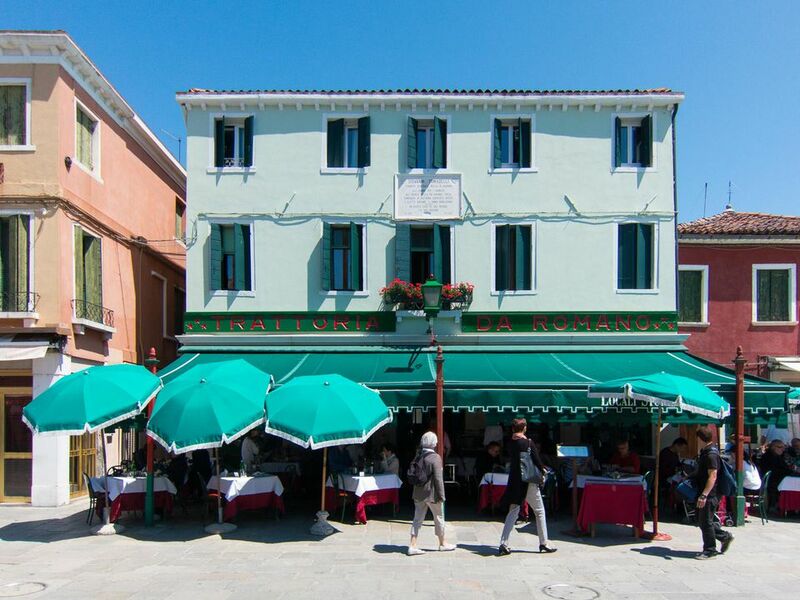 A couple of alternative selections of for good Burano restaurants are found on Martha's article: Burano Restaurants. Burano makes a wonderful day trip. It's colorful; there are good places to eat, and the walking is good. The island tours make a very nice day trip from Venice. Torcello island, a short vaporetto ride from Burano, also has some restaurants. So go. Eat well. Walk it off. Enjoy everything in the lagoon, even the fish that burrow in the mud. Should You Visit Venice With Your Kids?